Lots of emails regarding the August 2nd date for the budget deal as well as the gold/silver trade in the short term. Here’s a brief explanation of what I see in the astrology. Silver traders zip down to the end for the dates. For the debt ceiling debate: On June 7th I wrote on Zentrader about June 12, 2011 being a yank on the dollar, the wealth of the nation and most likely a slap to Goldman Sachs that would lead to the resignation of Blankfein. I explained how Saturn in the sky is acting as the “reeper” of karma for the bankers. Saturn is the equivalent of father time keeping a perfect set of books and will not give the Federal Reserve or the power elite bankers a pass this time with higher taxes on the people to bail them out. This battle is the karma can that got kicked down the road from the 80’s when the Economic Recovery Tax Act was passed in 1981 where the beneficiaries were the Wall Street firms and the losers were the taxpayers across Canada. 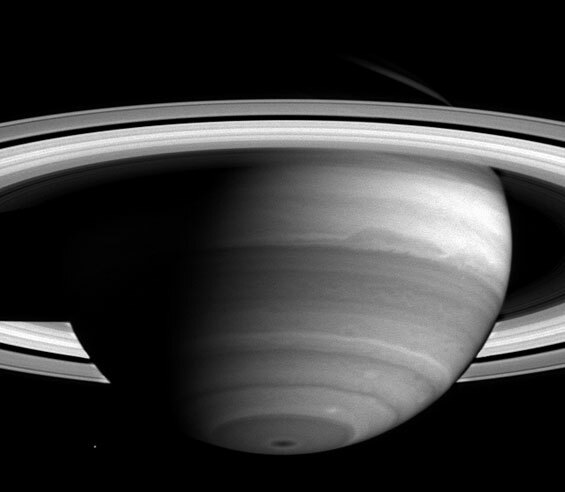 There are two very important factors with Saturn right now. Saturn’s orbit is approx. 29 ½ years so this brings us to the return of the S&L Crises where (the karma can) actions are now up for review. Saturn has been stationary at 10 degrees Libra for 2 months. This has not happened since 1833 during Andrew Jackson’s presidency and the “Bank Wars” with the United States Bank, a precursor to the Federal Reserve. Jackson won the “Bank War” when congress voted against re-chartering the bank and effectively shut it down. The United States Bank (paper dragon) was slaughtered however, as in a scary movie, has morphed into an even bigger PAPER DRAGON the FEDERAL RESERVE! The karma that Saturn is delivering is a yank on the printing of money, the hoarding of money, the elitist attitude about money, the lack of money, the control of money. This includes all forms of money and since gold and silver are also money the hoarding, the manipulation, the attitudes toward gold and silver as well as the lack of it are all going to get EXPOSED! GUT WRENCHING is the theme here. July 19th-24th – markets are up. July 21st – An imposition or finding fault with COMEX inventory. There could be supply demand issues regarding delivery. There is a transiting Venus in Cancer oppose the US Pluto in the 2nd house of banking. This means there is a false premise regarding the paper buying power and actual value of silver. The attitudes of the bankers to diminish the value because they hold dollars and not silver. I don’t see a major correction though . Jesse’s Café Americana just posted a chart showing the inventory (lack of) for the COMEX. Keep and eye on reports such as this because it looks to me like the COMEX (Jupiter in the 5th house represents the stock market and also the COMEX) is getting a flood of silver into it’s warehouse to fill orders. Are they bleeding the SLV or was a deal cut with another source, we will have to watch the numbers and see what happens. New highs aren’t that far off. August 1st – An agreement with the President and Congress that will be a loss to those close to retirement as well as those who are retired. There most likely will be more limitations for business. Saturn brings heavy responsibilities and restrictions. There is a possibility the negotiations are not final and carry into August. August 2nd – Mercury goes retrograde and most likey there is a yank on the credit rating of the US. Also a possibility that the dollar loses status for international settlements and the value of the dollar drops. August 5t – 7th possible correction in the markets and a bounce up for the dollar. August 11th A big rally could start here and continue into September. August 16th-19th possible correction with silver and gold. August – Inflation is a bigger issue with interest rate increases however Saturn in Libra will prevent hyperinflation. August – Neptune 0 degree Pisces brings deception regarding food prices and hiding inflation. There is more drama into the fall however the next line of support will most likely be over $50. Karen says: keep a close watch on the charts as Jeff posts them. Take some profits when it is warranted. Buy physical silver and gold coins right now they are cheap. Have been amazed to see how accurately and consistently you have been predicting moves on silver, gold and world events with specific dates. I have just read your latest article posted today. Would like you to kindly let me know if silver could hit 50 according to your astro predictions by mid august or post august after your august 16 th to 19th correction dates? Also could you pls guide me on the three basic dates mentioned . July 28th and aug 8th. These could see big upsides insilver n gold? Right? Just one more question. What does july 21st comex fault finding mean for silver? Again a upmove coz of comex shortages? Saturn transits are harsh like a “smack” or a “yank” of past actions or attitudes. It was clearly obvious in the tone of Mr. Paul and Bernankes struggle for a response that Bernanke got smacked! This is what a Saturn ‘yank “or “smack” looks like. Bernanke’s attitude about gold better change or it will get worse for him (Saturn will not give a pass on his current attitude) A dollar “yank” is when it gets downgraded by an authority (Saturn again) diminishing (that’s what Saturn does, takes away status) when there is karma (misuse of or abuse of) to make sure a change of course is taken. If not then the next Saturn transit is worse. This applies to the Fed as well. I will do a separate article on the Fed. For July 21st (21st – 23rd) problems with Comex. The US transit also coincides with Venus opp. Jupiter (in Capricorn) in the Federal Reserve chart. This is a double stack up that suggests the Fed also has an attitude to diminish silver (Capricorn is restrictive new laws rules etc.) Venus is in Cancer(rules silver) possibly acting through GATA, CFTC, or others to protect the stability of the Comex business and shore up it’s inventory to meet demand (Jupiter=supply) Also because Saturn is in Libra (Venus rules Libra) the Fed will have to comply and will not be able to repeat the rule changes that caused the crash in 1980. This is all part of the karma that Saturn has come back to fix, so Saturn is the overriding theme. I see this as a Comex problem but not a correction. Keep in mind the big picture. The correction April 28th ended on May 17th when Jupiter was at 26 degrees Aries. This was a HUGE critical point (1*, 13*, and 26* are the critical degrees for a cardinal sign) May 17th is a point in history that will be looked back at as a new turning point and planting the seeds for much larger moves in silver. Yes, end of July more increases. When Saturn goes back to 12 degrees I think Gold starts to really take off again with silver in tow. Pay attention to July 31st for gold when Saturn hits 12. Saturn was at 12 degree end of March which broke gold out of the dulldrums then. Since the 28th is a Sunday perhaps it is a gap up on the open. We will have to watch the charts for indicators. woww.. do you use Iching too? Karen…. awesome info. Thank your for the details! Karen-enjoy and look forward to your comments / articles. What do you see happening to precious metal ETFs like SLV, and GLD? Lots of concerns about their actual assets. It would be nice to invest in something like AGQ to maximize run of silver to 50+, but are the precious metal ETFs safe or will they collapse? 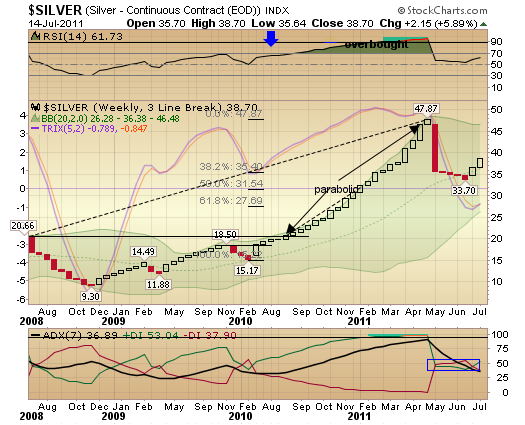 A gap up open today (18th july 2011) suggests a regain of 49.5$ levels for silver very soon. 🙂 can’t wait to see it.